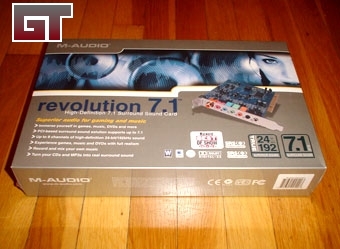 Today M-Audio was nice enough to send over a sample of their consumer audio card, the Revolution 7.1. I have had some wonderful experiences with their very high quality professional gear, so I was eager to see what they had come up with for the home market. Here are some pictures of the packaging. Nice and clean. 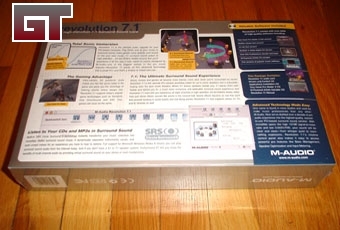 The box has way too much information on it, but one quick look at the lower right corner of the front will tell you everything you need to know. 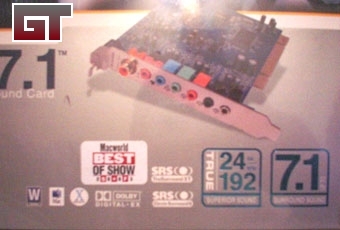 That's right, this sound card puts out high-definition 24-bit/192kHz audio playback and has 24-bit/96kHz mic/line recording. There are very few cards out on the market that can boast those numbers. As an added bonus, this card works with both PCs and Macs.